Freight charge collections, Cargo claims, Customer bankruptcies. The book also includes chapters that address special legal issues involving inter-modal drayage, warehousing and refrigerated transportation. An extensive glossary of terms Text Book written by noted Transportation Attorney Henry E. Seaton, Esq. Henry or "Hank" his friends and acquaintances call him is a Partner with the Law Firm of Seaton & Husk, LLP. He was awarded the Lifetime Achievement Award by the Transportation Lawyers Association and has been a long standing member and contributor to CCPAC. 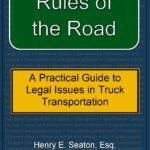 His book, "A Practical Gude to Legal Issues in the Truck Transportation" is a must have for your personal and/or company library. The 4th Edition of "Freight Claims in Plain English" is only available in CD-ROM format. This new format will facilitate use when traveling, when using laptops and notebooks, home computers, etc. The Publishers price for the CD-ROM is $285 but CCPAC Members can purchase the CD at a discounted price by logging into the Members Area and clicking on the Book Store in the sub-menu. The content has been expanded to cover many new subjects, recent developments and court decisions affecting transportation in general and claims for loss and damage to cargo in particular, including developments in international ocean and air transportation, intermodal, and cross-border trade with Canada and Mexico. The CD is in two volumes: volume one contains the text and index; volume two contains the appendices. Since its first publication in 1979, Freight Claims in Plain English has become THE BOOK for transportation and logistics professionals throughout the country who are involved in claims for loss or damage in transit. It is used as a text for students of transportation and as a reference for attorneys and paralegals involved in claim problems. ** Available in CD-ROM format Only. Like the first and second editions, a real-world, practical approach on how to deal with the twin problems of freight damage and freight loss. Author Colin Barrett discusses both the law and the reality of freight claims--understandably and succinctly--so that shippers and carriers alike can understand their rights and their responsibilities in dealing with loss and damage problems. In this new and expanded edition, Barrett has updated key areas in accordance with changes in the law and court decisions, and has added a wealth of further information. Written in clear, descriptive language; the plentiful legal references appear as footnotes. The meat of the book is easy to get to, and the footnotes are there when you need them. Too often legal discussions seem to be (to coin a phrase) of the lawyers, by the lawyers and—most regrettable of all—for the lawyers. Even those that purport to be in “plain English” wind up so riddled with legalistic phrasings and case citations that the lay reader is soon gasping with the effort to keep up. The law is important to everyone. And understanding the law is important to everyone. This book can help promote that understanding. - Latest text and material on statutes and regulations for transportation and logistics professionals. - The book covers hundreds of new court decisions since September 11, 2001 (the closing date for text material in the first edition). - New sections on Cargo Insurance, Broker Liability, Importing and Exporting. - The Homeland Security Department's jurisdiction over Transportation Security. - The government's reaction to the threat of new terrorists' attacks, and terrorists' use of transportation vehicles to deliver those attacks. - It contains an introduction to Hazardous Materials by Richard Custer, retired from Corning, Inc. and now a consultant on Hazardous-Materials and Transportation. - An expanded section on Railroad Regulation by Fritz R. Kahn, Esq., former General Counsel for the Interstate Commerce Commission. Quantity discounts: For more information, please contact us DIRECTOR@CCPAC.COM. 20 years in the making! The only such resource available today!! This is a contract form book with complete contract templates and a CD-ROM designed for easy use by shippers and their attorneys. Why spend valuable time and money to “reinvent the wheel”? Prior to 1980, virtually all transportation provided by motor carriers moved according to the terms and conditions of the Uniform Bill of Lading as contained in the National Motor Freight Classification. This is why the Bill of Lading was often referred to as the “contract for carriage.” After 1980, shippers and carriers began to negotiate individual contracts. The primary motivation for shippers to negotiate individual contracts is to avoid the “unintended consequences” and tariff “surprises and traps” which are typically found in a carrier’s private tariffs, terms and conditions, service guide, etc. These could relate to limits of liability for loss and damage, accessorial charges, or other “special charges”, late payment penalties, and other items which a shipper would not knowingly agree to prior to doing business with a carrier. The drafting philosophy of the Contract template is to be “shipper friendly” in that its terms are generally more favorable to a shipper than those that would be found in a carrier’s own tariffs or terms and conditions. However, at the same time it is drawn so as to not be so onerous for a carrier that a carrier would automatically reject it.